Tromsø has around 750 parking places available on the city streets. Parking meters accept coins and credit cards. There is no free parking in the city center during the daytime. If you are at a place without a parking meter, you should probably not park there. The Norwegian Road Traffic Act states that everyone driving in this country have a duty to understand and follow rules and regulations. And everyone driving a vehicle in Norway has an active investigation duty. This means that whenever you are parking a vehicle, you have a duty to make yourself acquainted with the parking regulations in the area. You have to make sure that you are allowed to park in the place you have chosen. If you are not certain that you are allowed to park in the spot you have chosen and you can’t find someone to help you, it may be better to find somewhere else to park. And by making the extra effort you may save yourself a lot of money in the process. Please browse through the Rules and regulations section. We have collected a few of the most important regulations there. Questions about parking in Tromsø? Feel free to contact us with any questions you may have. We can be reached by e-mail, phone, regular post, or you may stop by our office. If you have been unfortunate enough to receive a parking fine and you disagree with the decision to fine your car, you have the option to appeal. This must be done within three weeks, and the fine have to be paid in full even if status of the appeal is still pending. If the reasons for your appeal is accepted and the fine is terminated, you will get the money refunded. If you wish to write an appeal, you can fill out the form on our appeal page, just enter the case number (saksnummer) and the cars licence plate number (bilkjennemerke) or you can send us an e-mail, or letter. The cars licence plate number (bilkjennemerke). The date on the fine. Your full name and address, and also what country. Any documentation pertaining to the case. Wrong or incomplete information in the appeal may cause the appeal to be rejected. The Norwegian Road Traffic Act states that everyone driving in this country have a duty to understand and follow rules and regulations. This means that claiming you don’t understand the rules, or that you couldn’t read the sign, is not a valid cause to appeal. Violating Norwegian parking regulations is punishable with fines up to 900 NOK and/or your car may be towed away at your own expense. The city centre of Tromsø is regulated as a restricted parking zone. This sign is posted at every entrance to the city centre. The sign indicates no parking allowed anywhere within this zone. This means, that if there are no other signs, you should not park there. This sign means no parking. Wherever this sign is posted there is no parking allowed. However you may still drop off or pick up passengers and goods, as fast as possible. The sign is valid from the place it stands and forward until it is ended by another regulatory sign or an intersection. This sign indicates no stopping, this includes stopping to pick up or drop off passengers or goods. The sign is valid from the place it stands and forward until it is ended by another sign or an intersection. stops. This means you cannot park your vehicle in an intersection or nearer than 5 meters (16,4 feet) to it, calculated from the beginning of the curve. There are no signs indicating the beginning of an intersection. You are not under any circumstances allowed to stop or park on the pavement/sidewalks. This includes stopping to pick up or drop off passengers or goods. You can not stop or park on pedestrian crossings or nearer than 5 meters in front of it. You can only park in areas regulated with this sign, and with this sub-sign. The sign “Mot avgift” indicates payment parking, and the numbers indicate that it is during the daytime and what the maximum parking time is. Be advised, there are no free parking in the city centre during the daytime. Our payment machines takes coins and most VISA and Mastercards. Some parking lots outside of the street may use the same signs, and the same rules as above apply there. If you are on a street with any other sign than the one above, you should not park there. 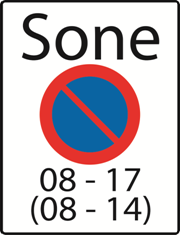 For example, you can not park in areas where the blue sign, With the text «P-kort for beboere og næringsdrivende», or variations of it, may be displayed. The sign indicates that only residents and businesses with valid parking permits can park there. Parking lots outside of the street often have some different signs. But remember you can only park on parking lots with the sign “Mot avgift”, which indicates that you may park there, but you have to pay. Usually all parking, besides street parking, have payment 24/7. Fjellet is an underground car park, which spans beneath most of the city centre. The facility uses an automated barrier system, when entering the underground car park you get a single use paper ticket, and the barrier opens. You park the car in an empty spot, and can leave it there for as long as you like. Before retrieving your car you simply pay the ticket in one of the payment machines located near the entrance then get your car and use the same ticket in the barrier on your way out. Seminaret is a parking facility located at the «entrance» to the city, just north of the bridge. Parking for the general public is on the upper level. The lower level is reserved for residents with special permits. Seminaret uses a standard payment system where you pay in advance on the machine inside.